Are you looking for the exclusive line of Kids Rakhi? Well then you are definitely at the right place. 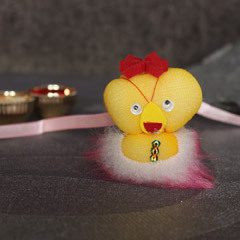 Here at Send Rakhi.com, we are offering below an exclusive line of Kids Rakhi that is inclusive of most attractive varieties of Kids Rakhi in eye catchy cartoon, car or doll designs and patterns. 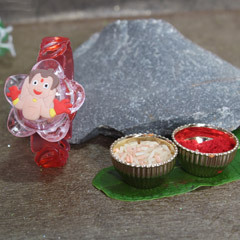 Explore the range below to find the best Kids Rakhi online. 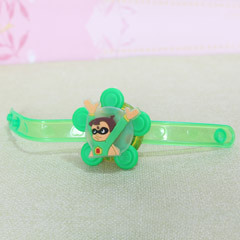 Rakhi for kids is nowadays available in various exciting designs. The main attraction of Raksha Bandhan festival is Rakhi and kids find it really exciting to tie Rakhi on their wrist. People shop for beautiful Rakhis a week before the festival. Markets could be seen flooded with spectacular kinds of Rakhi for kids. Rakhi is a festival when sisters tie Rakhi on their brother's wrist. Here is the list of kids rakhi. Fancy Rakhi: Something fancy always interest kids and they often like something that is attractive to their eyes. Fancy Rakhis are available in various colors and designs with glitters and sequins work. These Rakhis are made in various shapes and designs to make it suitable for kids. 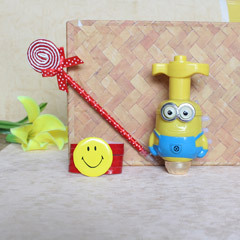 Cartoon Based Rakhi: Cartoon characters are popular among kids and now Rakhis are made in the shape of famous cartoon characters like Donald Duck, Mickey Mouse, Tweety, Little Hanuman, etc. 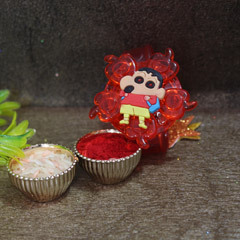 These types of Rakhis are made especially for the kids. Charming Rakhi: Charming Rakhis are those Rakhis that are made in various artistic ways like with small bells, stars, moon, etc. These kinds of Rakhis are a favorite among kids as it matches their mood of celebration. 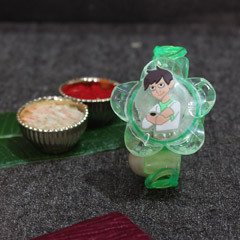 Select the kids rakhi based on these above-mentioned options. Rakhi is an auspicious festival of India and tying Rakhi on brother's wrist is an important ritual of this festival. A week before Rakhi, markets are flooded with various kinds of attractive Rakhis. 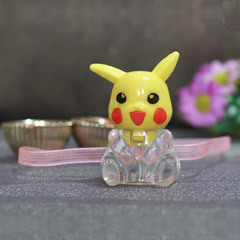 Nowadays, Rakhis are made by keeping in mind the age group, like Rakhi for kids, would be different from Rakhi for adults. Rakhis are usually made of threads, plastic, clay and light metals. 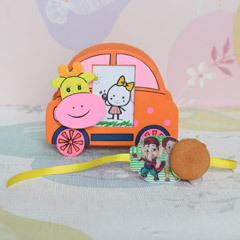 Various kinds of creative designs and works add more charm to Rakhi. Many people buy Rakhi made of gold and silver but whether you will go for it or not depends on your pocket. 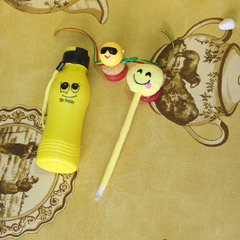 So, this Rakhi season gets some of the best Rakhi for kids and make your celebration special. Surf through the pages of sendrakhi.com for more information on Rakhi. Sendrakhi.com has helped all those sisters out there, keen to send Rakhis for their brother. The team at our portal, on the basis of 69 customers’ reviews has received 4.0 star rating.